This is my first post on the forum so I thought I'd introduce myself by way of attaching a simple book cover that I've been experimenting with. I know it's pretty basic stuff but I'm still finding my way around. No external images were used, everything was drawn in Affinity Designer. I've only been using AD for a week or so - mostly just a few hours here and there when I get the time - but I'm very impressed with the features and usability so far. I made the cover as a throwaway experiment but if anyone has any suggestions about improvements - fonts, colours, lighting, whatever - then I'd be happy to learn. 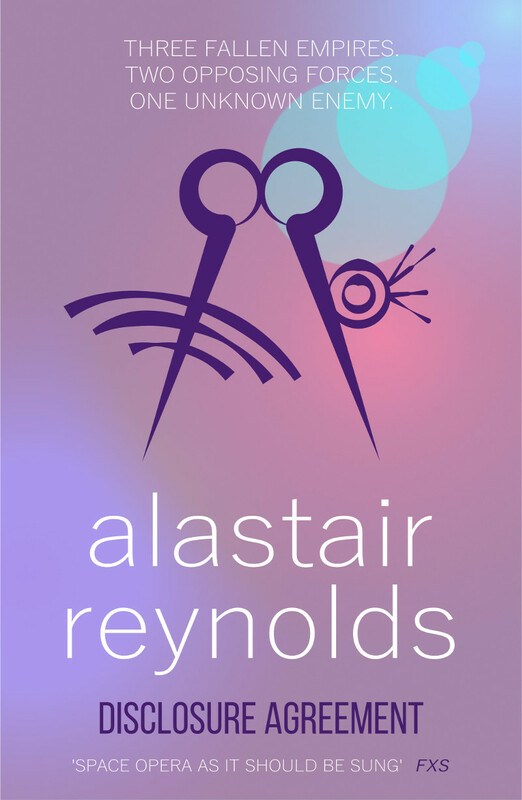 I know the "alastair reynolds" font isn't right but I can't find the correct font - I think it's supposed to be Helvetica Light - for free. Can anyone give me a link to a better free font? I'm not entirely happy with the background. If anyone can point me in the direction of a good tutorial for this kind of thing - merged gradients and lighting - that would be great. If I get some good suggestions then I might do an updated version and post it here. Edit: I've attached a smaller image so it can be seen more easily. I guess "Disclosure Agreement" is the actual title of the book, right? It should be larger than the author's name. The symbols in the center, looking at the small version, look like a cartoon mouse seen from its back. I would avoid having two semi-circles next to each other on any cover design, by the way. Also the symbols themselves, parts of them are sharp shapes and parts of them are irregular shapes, is that intentional? I agree with you about the source material. The original cover designs for the books - before the total change in design - were much better in my opinion. I was messing around with some AD features and thought, hang on, this looks a bit like those covers, so I decided to go down that direction to see what I could do (I was still on the trial version of AD). For the book title I know what you mean but that's how the actual covers are made so it wouldn't have looked right if I'd done differently. I was trying to make it look like part of the series rather than trying to improve on things. Having said that, I think you're right though. * the whatever-it-is on the right to be the "one hidden enemy" (at the back of one of the forces). I guess it's not much of a concept if it leaves people wondering what the heck it's about. As for the shapes, I was just playing around with the brush functions and seeing what they could do. What I got was pretty much what I wanted but that doesn't mean it was what I should have been trying for (if you know what I mean). Anyway, thanks again for the feedback. It's great to hear from people like yourself who know more about this kind of thing than I do, and it's always good to learn new things.